Garden trimming tools in the spotlight on Tool Time, growing beans that suit winter conditions in vegetable heroes, they may be old fashioned but we love them in Plant of the week and the oldest flowers on earth in Talking Flowers. Which jobs do you hate doing in your garden aside from weeding? Lawn edges could be one of them? There’s always ways to make gardening a bit easier and this next garden tool or perhaps machine is for those jobs that are generally too hard to do by hand. Although some gardeners still like to do those jobs by hand, trimming lawn edges for example, it’s very time consuming and just plain hard work. So what type of device do we need for our lawn edges? 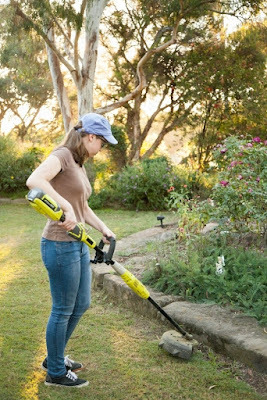 Whipper snippers, brush cutters, or just trimmers, all do similar things. Like a lot of garden tools don’t be swayed by just the price alone. If you’re going to use it for any length of time, make sure you can hold it without causing strain to arms and shoulders. If you're annoyed with the whipper snipper cord constantly breaking why not change to a pivot head. This can be fitted onto most whipper snippers or brush cutters. 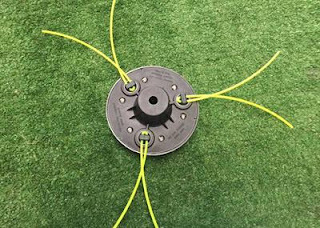 The pivot action is 360 degrees and as it hits a bit of concrete or post or tree trunk, it just bounces off, so that there's less wear and tear on the line and less breakage. Tony's Tip: Don't go for cheap whipper snipper line. Buy good quality commercial grande line of 2 - 2.7mm thickness. Broad beans are one of the easiest vegetables to grow in your veggie patch. Vicia faba or BROAD BEANS or some people know it as the Faba bean. Broad beans are native to North Africa and southwest Asia, but they were cultivated in other regions very early on as well. Fossil evidence has been found of Broad Beans being grown at least 4500 BC. Did you know that in the Roman Senate the beans were used to vote, white bean for yes and black bean for no? Maybe that’s where the term bean counters comes from? For a long while, when cooks and mistresses went to the markets for beans, they were buying only broad beans because they were “ ‘the bean’, for century after century”. Only after “scarlet runners, haricot, kidney and butter beans” turned up, did “they become known as broad beans. Although broad beans are from the Fabaceae family, they look different and grow differently to their bean cousins. Broad beans grown into a large, upright, bushy plant up to about 1 ½ metre. Most varieties have white flowers with black eyes, but some older varieties have red flowers that look nice, but don’t set pods nearly as much as the white flowering ones. Each pod is shiny green with very short fuzzy hair, and is roundish, and quite long with a pointy end. Each Broad Bean pod also has a firm, pliable skin and contains 4-8 light green to white, rounded and kidney-shaped beans. 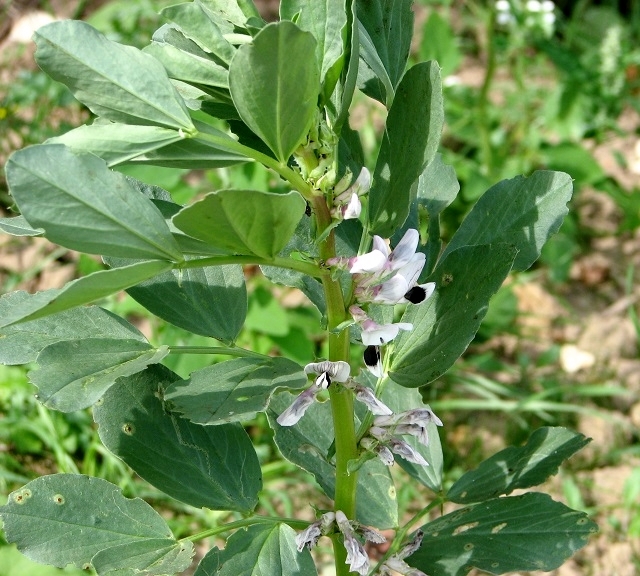 The bean plants tend to be bushy, with square, hollow stems and without beany tendrils. There’s two main varieties, the dwarf bush or the tall variety that needs staking. Like all beans, they fix atmospheric nitrogen and so, are also useful as a green manure. Best of all, they are hardy, easy to grow. Plant them in March to June in temperate and sub-tropical areas, April to July in arid areas, , and April and May, then August and September for cool temperate zones in Australia. 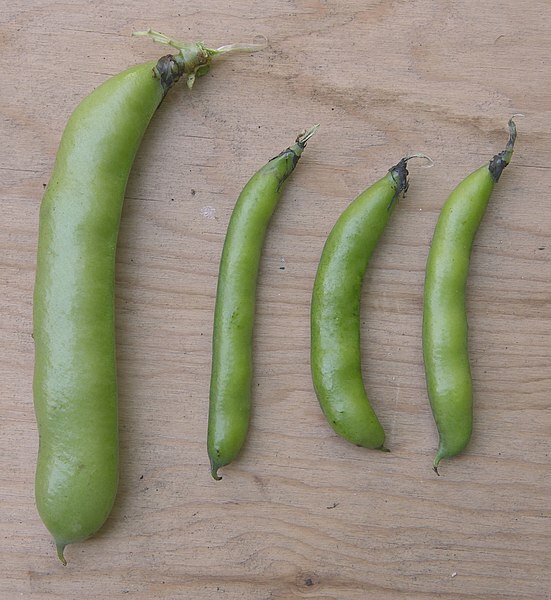 Broad beans prefer a sunny well-drained position in the garden. Broad beans can be grown in soils with high salinity, as well as in clay soil, so they're pretty adaptable. As far as soil in the veggie bed goes, don’t put in too much of the chook poo or other rich manure as you'll only get leaf growth rather than flower (and bean) production and will make the plant more sensitive to frost and disease. 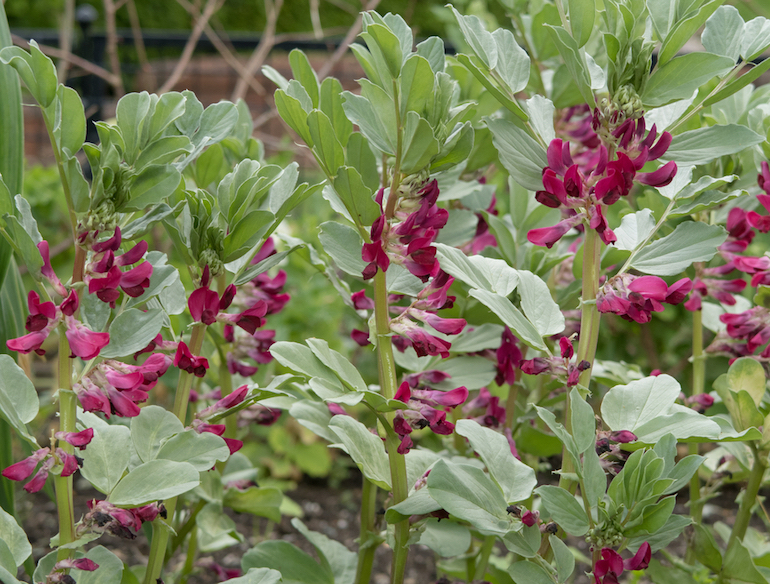 Direct planting into roughly prepared soil is the best way to grow Broad Beans. Sow the seeds at a depth of 5-10cm, with 15-20cm between plants and 70cm or 2 ruler lengths between rows. That's if you've got the room, but there's a reason for this.. Your broad beans will start sprouting in about 2 weeks after sowing, but will be slower the later you sow towards winter. Soaking seeds overnight in diluted liquid seaweed can speed up germination. Water seeds well as soon as you've put them into the ground and, then, don't water them…MOST IMPORTANT until after germination, to prevent the seeds from rotting. Ok, YOU CAN'T DO MUCH ABOUT IT IF IT RAINS. Broad beans will need to be staked or supported to stop the plant collapsing under the weight of the mature beans. If your district experiences a bit of frost, flowers formed during frosty weather are probably not going to set pods. Once spring arrives, pinch out the tips of the plants to encourage pod set. Try to limit water stress as this will also affect pod set. That means don't let them dry out! In 3-5 months, depending on how cold the weather is, the beans will be ready. Broad bean pods can be picked at several stages. Firstly, they can be picked when small and can be snapped crisply in half. In which case you can eat them like young green beans. Secondly, if allowed to grow larger but the seeds are still soft, you don’t have to shell the bean seeds, but don’t eat the pods at this stage. Finally, they can be grown until fully mature and the seeds have dried. In this last case the seeds are used as dried beans and are called Lima Beans. Broad beans are prone to fungal attack - brown spots on stems and leaves - particularly if planted too closely together or if planted in soils too rich in nutrients. Towards the end of the crop, rust - producing powdery spots on the leaves - can become a problem. Plants with black tips may suffer from root rot, caused by poor drainage. 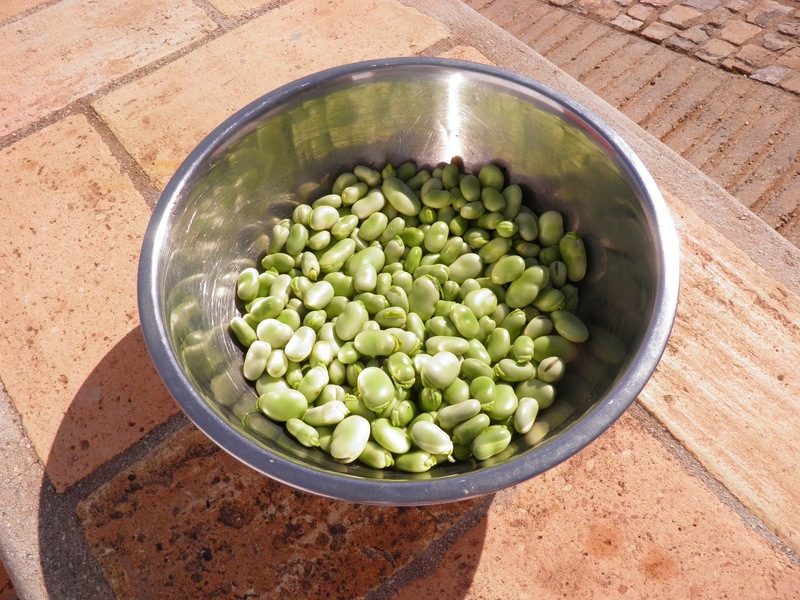 Get rid of those beans and put in a new lot..
Freshly shelled broad beans can be frozen, blanched and then frozen or stored in the fridge for about 5 days. Broad beans are legumes meaning they convert nitrogen in the atmosphere into nitrogen in the soil. The nitrogen is attached to their roots and becomes available in the soil once the beans die down. Dig in the roots and leaves after picking all the beans, to add nitrogen to the soil. You can then lay the tops on the soil or use it as mulch elsewhere in the garden. It, too adds nitrogen to the soil as it breaks down. The fresh beans are eaten steamed or boiled. As the beans mature it is better to remove their tough outer skins after cooking. The leafy top shoots of the adult plants can be picked and steamed after flowering. Beans are high in protein and carbohydrates, rich in vitamin C and are also a good source of vitamins A, B1 and B2. a good source of folate. Beans also provide potassium and iron in fact 100g of beans has as much iron as a pork chop. AND THAT WAS OUR VEGETABLE HERO SEGMENT FOR TODAY! Hydrangea macrophylla: Mophead Hydrangeas; Lacecap Hydrangeas. Let’s find out what else they have to offer. The large heads of pink, blue or white flowers are very attractive as a cut flower also. Did you know that around 1879 the famous English nursery Veitch , sent the plant hunter Charles Maries to China and Japan? So what did he come back with? Two different plants, a Hydrangea with flat flowers (lacecap) he called H.macrophylla 'Mariesii' and a spherical type , he called Hydrangea macrophylla ' Rosea' . Jeremy's tip: Cut back to a few centimetres above the ground to rejuvenate old and young plants alike. Marianne's Tip: . The pink or blue flowers depend on the soil pH in which they grow. pH of 5.0 to 5.5 for blue flowers; pH of 6.0 to 6.5 for pink flowers. If you want to change colour of your hydrangea flowers, do it in winter by applying either aluminium sulphate for blue flowers or several cups of garden lime around the plant for pink flowers. Protea nerifolia "Special Pink Ice"
Proteas are one from one of the oldest families on earth dating back 300 million years. This variety produces stunning pink flowers through autumn and winter - great for cut flowers and attracting birds into your garden. Prefers full sun, well-drained soils. Tolerates frost (-4 C)and extended dry periods once established. 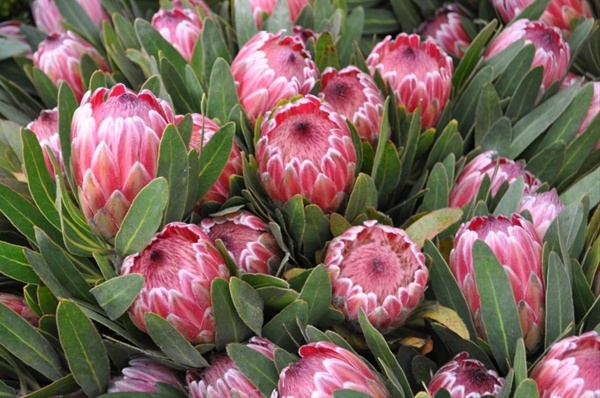 Pruning your Protea plant is never more than 50% of the leaf cover. Don't prune non-flower stems as they will bear next year's flowers. Mercedes Tips: Cut stems at an angle and change the water daily. Use only filtered water and plenty of it as they are waterholics. Marianne's Tips: Not suitable for areas with severe frosts or for sub-tropical and tropical zones. Indoor plants are making a great revival in Plant Doctor, growing a coffee substitute in vegetable heroes; herbalist and naturopath Simone, talks about Parsley in Plant of the week and what makes a garden French and provincial on garden styles in Design Elements? If we were fashionable and hip young gardeners, we would all be talking about where to go to find the next happening for indoor plants. Usually a trendy café or other venue where indoor plants are sold to the unsuspecting young folk for enormously inflated prices. But, if we’re not in that category, we probably would like to refresh our memory about looking after those indoor plants. New to gardening and not sure how much to water? Leaves yellowing or browning on the tips can be under or over-watering. Different plants have different responses to watering so it's important to do some research about the plant. Find out if your plant likes to be dry between waterings, such as Zee Zee plant ( Zamiocalcus spp) or Anthuriums. Stick your finger into the potting mix to test for wetness or dryness. If you’re averse to sticking your finger in the dirt to check how much moisture is being held in the soil, you can buy a moisture meter fairly cheaply. If you’re electronically inclined you can even make your own moisture meter. Have you ever eaten chicory? What do you do with it other than give it to your chooks? Apparently the leaf chicory is very good for them? Did you know that there’s actually two types of chicory, both of which are considered a vegetable? There’s the leafy type and the one where the tap root is used more. But let’s begin with some interesting facts. Chicory comes from the daisy or Asteraceae family, and like dandelion, chicory has been grown since ancient times as a pot herb. A pot herb is one you put in a pot along with your meats and vegetables and cook together for a while-usually a long while. Chicory is most likely native to the Mediterranean region and it’s an interesting plant because it’s been used in coffee substitutes and additives where the roots were baked and ground. You probably didn’t realise that Chicory used as a coffee substitute during the Great Depression in the 1930s and during World War II in Continental Europe. Chicory, together with sugar beet and rye was used as an ingredient in East German Mischkaffee (mixed coffee), during the "East German coffee crisis" of 1976-79. Do you realise that if you’ve ever drunk a coffee substitute, like Caro, then you’ve drunk roasted chicory root? Some beer brewers even use roasted chicory to add flavour to stouts. Some other beer brewers have added it to strong blond Belgian-style ales, to add flavour to the hops, making a "witlofbier", from the Dutch name for the plant. So how come chicory can be used as a coffee substitute? Chicory contains two polysaccharide, inulin and fructose. When these are roasted, inulin is converted to something called oxymethylfurfurol, (OXY-METH-OL-FUR-FUR-OL) and this gives off that coffee-like aroma. Did you know that the first person to grow and process chicory in Australasia was Edwin William Trent (1839 - 1883)? Eddy or Edwin, operated a steam coffee mill in Nelson in New Zealand, and later moved to Christchurch where he established the first steam coffee mill in Australasia in1863. How it worked was by coke fired furnaces in kilns producing hot drying air. This hot air passed up through the chicory roots which had been cut into small cubes and laid on floors of perforated tiles. The steaming chicory had to be turned every two hours and five tons of green root were needed to produce one ton of kiln-dried root. After the drying process was over, the chicory was taken to where the roasting and grinding was done and the chicory blended with expensive coffee imported from the West Indies, South America and Africa to make the coffee and chicory essence. Did you also know that Chicory, or Cichorium intybus, was grown as a crop on Phillip Island for nearly 100 years from the 1870s? If you’ve visited Philip Island you’ll see some unusual small brick towers dotted about the island. These are chicory kilns, once used in drying chicory dock – a parsnip-like underground root of the Chicory plant that was grown widely in Phillip Island’s rich volcanic soil. Are you thinking, I’m not going to bother drying and roasting the chicory root, what on earth do I need to grow this ahem, vegetable? Here’s the reason: Chicory is actually a nutritious food. 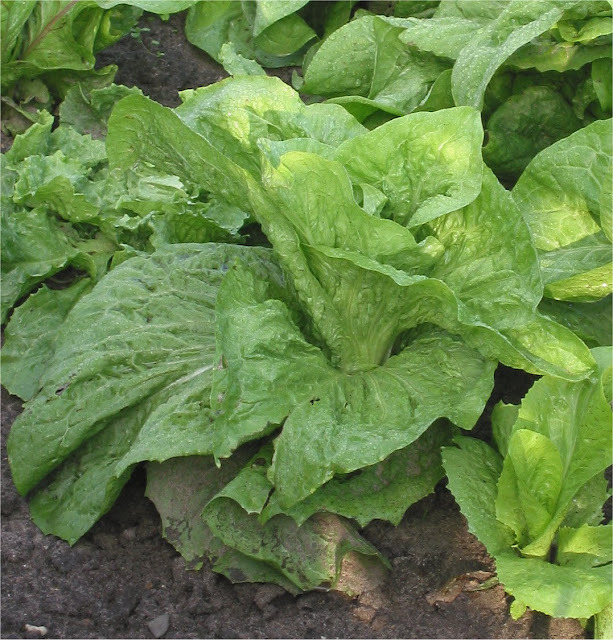 The leaves of the chicory plant can be eaten in salads to add flavour and crunch. They can also be lightly roasted in olive oil. You can buy seeds of Chicory “Red Dandelion: this plant has red stems with deeply cut frilly deep green leaves. As a microgreen or ‘baby leaf’ this variety adds great flavour to salads and it’s a colourful addition to any mesclun mix. If you get the red variety, it’s one of the few red leafy vegetables that keeps the crimson colour when cooked. Chicory ‘Red Palla Rossa’ is a small heading chicory, 8 - 10 cm across . The bright red, very tight heads have prominent white midribs. It has a slightly bitter, tart taste. As a ‘baby leaf’ they add great flavour to salads. There’s also the coffee chicory plant or Chicory Coffee 'Magdeburg' which also has the same botanical name of Cichorium intybus. This chicory is also a frost hardy plant but with a long taproot topped by a whorl of oblong, broadly toothed, milky-sapped leaves. The flowers are on top of 1 ½ metre tall, zig-zagging flowering stems with a few sparsely placed leaves and lots of sky-blue to purple flowers. Flowering is mostly in summer and the 50 cent-sized flowers open at the beginning of the day but close as the heat becomes intense. 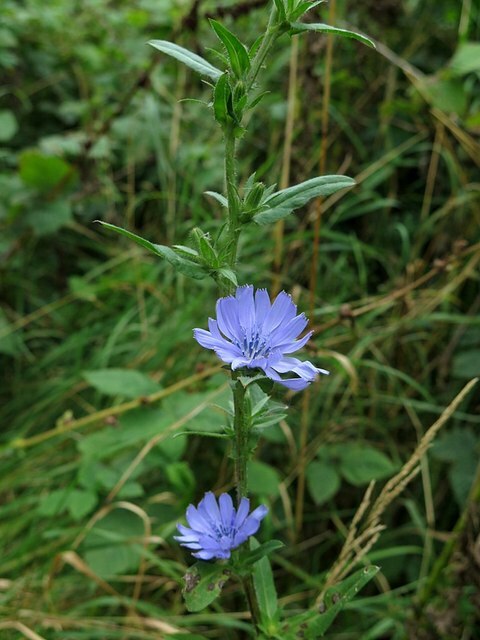 Chicory plants flower for several months and the flower looks quite a lot like a purply-blue dandelion flower. Like dandelion, the seeds are spread by wind. Also, like dandelion, the leaves are concentrated in a whorl, just above the soil surface. If you really wanted to you could dry and roast the roots, then grind them for a coffee substitute. The leaves and young roots can also be cooked as vegetables. The roots can grow up to 30 cm long and weigh as much as 1 kg. The one I have in my garden has been there for over a year so I’m guessing that it’s going to have a heavy large underground root. Chicory is a hardy vegetable and frost tolerant but does wilt a bit on hot days. It’s a useful cool season crop to add interest to winter salads. To grow the leafy Chicory, for sub-tropical areas, April to June is the time to sow, in Temperate areas March until May, for Arid areas June to August, and Cool temperate districts, sow late summer to mid-autumn. In all cases sow the seeds directly where they are to grow. 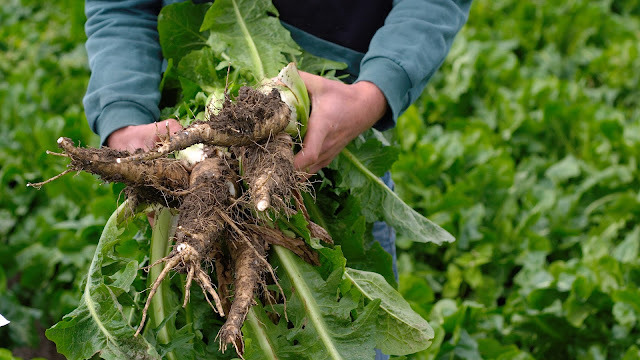 So to grow Chicory you need a well- drained, deep soil. Chicory will also grow on heavier soils as long as they’re not likely to get waterlogged for extended periods. If you’re wondering where to buy the seeds of coffee chicory, there are some stores that sell them if they carry an Italian seed line otherwise online seed suppliers do so as well. Are you wondering if Chicory is just as weedy as Dandelions? It’s unlikely to become a weed since plants tend be short lived. If you’re growing the coffee chicory, the fleshy taproot of the first year’s growth is dug up in winter, dried, ground and roasted. (Roast the roots on low heat (around 25 C) until crisp, then grind with a little roasted barley (around 400F or so) for a wholesome coffee substitute. Here’s an interesting fact: Coffee is readily available now in all types of strengths but until the 1960s, before instant coffee was invented, coffee and chicory essence was a popular alternative to using roasted coffee beans. Do you remember that thick black liquid with a very distinctive attractive aroma and sold in squarish bottles with a blue label? It was often drunk with sweetened condensed milk. Why is Chicory, good for you? One of the major functions of chicory is to increase the body’s ability to absorb calcium. They also contain folate and like other green vegetables chicory contains good amounts of potassium. Chicory is also good for the digestion, and the circulatory system. 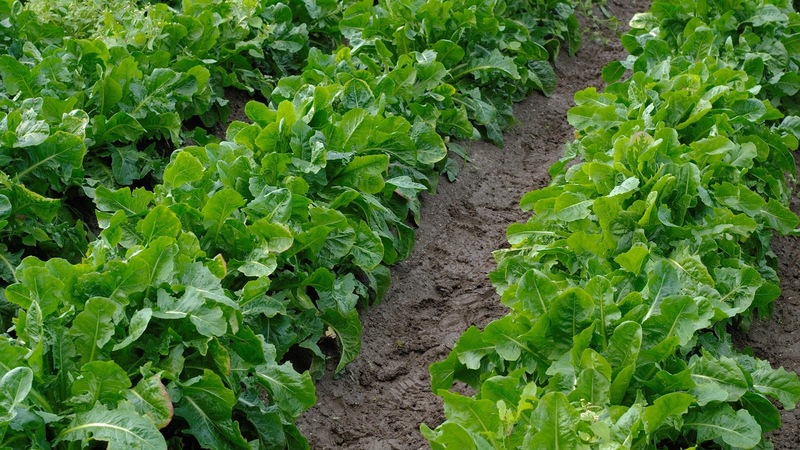 From an agricultural point of view, Chicory is used as a short and medium term forage, and is an alternative to lucerne in areas where soils may be too acid for lucerne. Tolerates a pH down to 4.2. 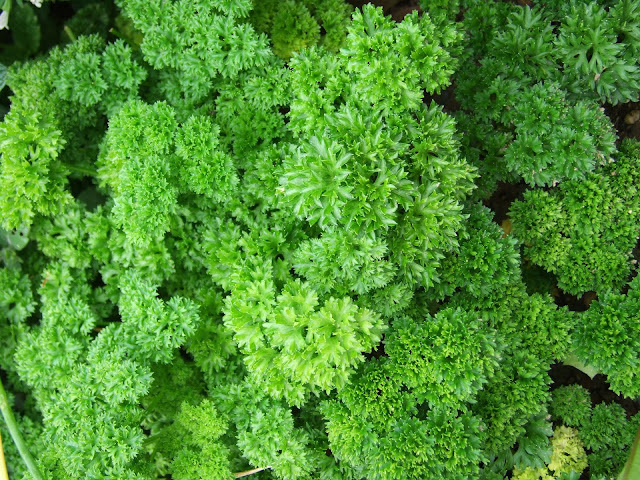 Parsley (Petroselinum hortense and Petroselinum crispum) is an herb that originated in the Mediterranean region of southern Italy. Parsley is used a lot by some gardeners to feed the winter possums that are looking for something to eat. It’s used a lot in cooking and much better to grow your own and only harvest as much as you need without needing to store it in the fridge. Let’s find out what else parsley has to offer. Grows as a biennial in temperate climates or annual in subtropical & tropical areas. Grows a taproots used as a food store over winter. Others grow parsley and let it go to seed to attract the benny’s which means the beneficial insects. Really nice in a potato salad. The secret is to cut it up very finely because it’s quite coarse so it doesn’t get stuck in your throat when you eat it. Juice it with apple and celery so it doesn’t taste so medicinal. If someone asked you to describe a French Provincial garden what would you say? What would be the key elements of such a garden? Would it be quirky frenchy nic nacs, and include a trompe l’oeil or a parterre? Would it include plants that are French? I'm talking with Danielle Collier from Artistic Horticulture. Favourite garden plants: for a French garden might include architectural plants. Agapanthus. Canna. Mediterranean Plants. Acanthus mollis, bear's britches. Iris. Perennials. Aquilegias. Dahlias. Grasses. Phormium Tenax. Shrubs and Hedging Plants. Roses. Garden Bulbs and corms. Alliums. Trees. Acacia dealbata, Toon chinensi or Chinese cedar. Gorgeous small birds that for once are easy to identify in the Wildlife in Focus segment with Dr holly Parsons, growing leeks in vegetable heroes, a new series on garden styles in Design Elements and today is what makes a formal style and what is Anthuriums in the Talking Flower segment. Small birds are notoriously hard to identify because (a) they’re small, (b) they’re incredibly fast and shy and lastly, they’re usually just a variation on brown. Not so this next bird which has easily distinguished facial markings and is Perhaps you can spot one after listening to this. Described as having an owlish face, although in miniature, and with beautifully spotted wings. Incredibly gorgeous little bird with a striking white face. Like a miniature barn owl because of the markings. 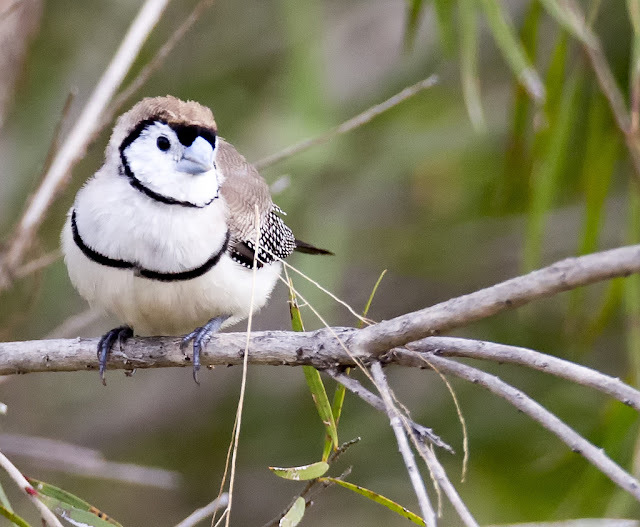 For once, not just a little brown bird that's hard to identify; this one has distinctive features which apart from the white face, the barring on the feathers stands out also. Hanging around in flocks you’re bound not to mistake them for something else because they would make a spectacular sight. Leeks, known scientifically as Allium ampeloprasum var. Porrum, are related to garlic, onions, shallots, and scallions. There’s nothing like a good long history that some vegetables seem to have and the Leek is no exception. Leeks are supposed to be native to Central Asia, and have been cultivated there and in Europe for thousands of years. Did you know that Leeks were prized by the ancient Greeks and Romans because of their supposed beneficial effect upon the throat. The Greek philosopher Aristotle thought that the clear voice of the partridge was due to a diet of leeks, while the Roman emperor Nero supposedly ate leeks everyday to make his voice stronger. Another interesting fact that you might not know is that the leek became a Welsh emblem in 1536, and is still the national emblem of Wales. Daffodil is the National flower. Have you ever wonder why Welsh are such great singers? Perhaps because they eat a lot of leeks, think Tom Jones. Onions, celery, and carrots are very good companion plants for the leek. Leeks, are a cool season crop and best of all they’re easy to grow. You can grow leeks in hot summers, but you won’t get the same quality result as you will in a cool summer environment. I know I’ve tried and they were a thinner weaker version of the winter leek. Leeks are usually grown from seed and are generally started off in punnets first then transplanted. Sow the seeds of Leeks from Spring until the end of Autumn in cool temperate climates, and late summer and autumn in warm and tropical zones, and in arid districts, seeds must be sown in February/early March and then you can transplant them in April and May. I sowed some seed a several weeks ago and have already transplanted them into the veggie bed because they were a couple of inches-about 10cm high and were the thickness of a pencil. TIP: By the way, the seeds germinated fine from an out of date packet. Leeks will overwinter in cool temperate areas of Australia if properly mulched, but will generally not survive periods of extreme cold. In case you don’t know what a leek is. Leeks look like large fat spring onions, but have a very small bulb and a long white cylindrical stalk of layers of white then green, tightly wrapped, flat leaves. 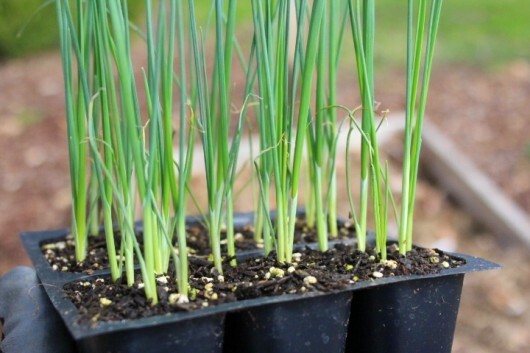 It goes without saying that good soil is the key to growing leeks. Leeks need nutrient rich, well-drained soil with a pH between 6.0 and 7.0. They’ll do well in almost any garden soil as long as it is well aerated and deep, about a spade’s depth is good. Using some kind of dibble tool or stick to make a hole that's just deep enough to leave only the top inch of the seedling exposed. Set the leek seedling into the hole and fill it loosely with soil. Space the leeks 10cm or a large hand span" apart, in rows at least 25cm or from your wrist to your elbow apart. Find something practical like that to do you estimates. Some people think that when growing Leeks the aim is to blanch the stems while the plants are maturing. To save your back if you want to blanch the stems, rather than digging a trench, just use mulch. When they’re 4 weeks old in the veggie bed, use a thick mulch of sugar cane or something like that. In another 4 weeks or when they reach about 24cm, do the same again, or you can use shredded newspaper. The leeks will still grow as well if you don’t do any of this. Some gardeners cut off the top portion of the leaves, about halfway up the plant, as the leeks are maturing. This supposed to bring on stalk growth, giving you a larger leek for the dinner table. To be honest you can do all this, but if you don’t the leeks are just as tasty. Make sure the plants get at least a couple of cm’s of water a week; otherwise the stems will be tough to eat. Mulch to conserve moisture, and side-dress with manure tea once a month. Begin harvesting leeks as soon as they're big enough to use. Young, tender ones are good raw; once they reach the width of a paper roll, they're better cooked. They usually take 16-18 weeks--4 ½ months. Quite a long time so explains why they are so expensive at the greengrocer, market or wherever you buy them. To prepare Leeks cut them very thinly and sautee’ just as you would other members of the onion family. Like their allium cousins, onions and garlic, let leeks sit for at least 5 minutes after cutting and before cooking to enhance their health-promoting qualities. Leeks give you small amounts of other minerals and vitamins. The green tops have some beta carotene which your body can make into vitamin A. Like onions, they also have some sulphur compounds that scientists believe reduce your risk of some health problems. Leeks are believed to be good for the throat. Leeks are low in calories and fat-free. 100g of leek has just 125kJ. Formal gardens have a long history. Did you know that the style of a formal garden started in the Persian Gardens in Iran, such as the Monastery Gardens from the Late Middle Ages? This style was sort of carried over into the Italian Gardens from the Renaissance that’s the 1400’s and was further refined into the formal French Gardens from the Baroque period which was around 1650. Let’s find out what this style has to offer. Formal style is all about straight lines, no clutter, repeated plantings with as much symmetry as you can stuff into your garden. Add a water feature or two and some espalier or topiary, and voila’ you have a formal garden. 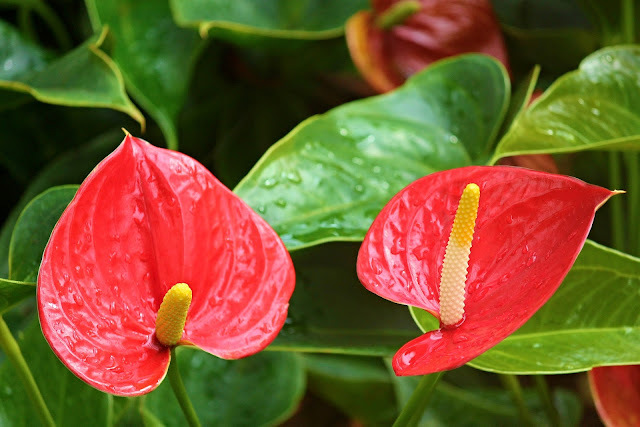 The anthurium flower derives its name from two Greek words: oura, meaning tail and anthos, meaning flower. Translated the phrase means tail flower. Anthuriums are evergreen subtropical plants with heart shaped leaves. Similar flowers to the Madonna or Peace lily. These flowers are really modified bracts, called spathes. The actual flower of the anthurium plant are tiny blooms that line the fleshy inner spike called a spadix. In their natural environment, Anthuriums grow on rocks or trees and in the home or garden need perfect drainage around their roots. An ideal mix is equal parts of premium potting mix and decomposed sugarcane and plants in a terracotta pot. Too much water in winter suffocates the roots and causes them to rot, so let plants go dry in between each drink. Flower vase life is up to 8 weeks if you look after them properly! Video recorded during live broadcast of Real World Gardener. Have you grown Borage? The Spice It Up segment will tell you how to use it. Growing ginger is easy in vegetable heroes, Modern garden styles in Design Elements old fashioned Geraniums in the Talking Flower segment. Summer’s over but some plants keep going to mid-winter. Regarded as a herb, this next plant is not available in the herb and spice section of your supermarket. You can find it in the herb section of some garden centres possibly. Perhaps you’ve grown it for the bright blue flowers and not really taken much notice of how else you can use this herb. Borage leaves are rather hairy and don't look appetising at all. You may have never wondered about using the leaves in cooking before. But now you know to eat the leaves of Borage. Just chop them finely into soups and sauces. Ian recalls a soup his mother made that had potatoes, cauliflower and finely chopped Borage leaves. Saute' a big handful of young finely chopped borage leaves in butter, add 500ml of light chicken stock and a peeled, chopped potato. Cook until potato is soft, then use a stick blender to blend until smooth. 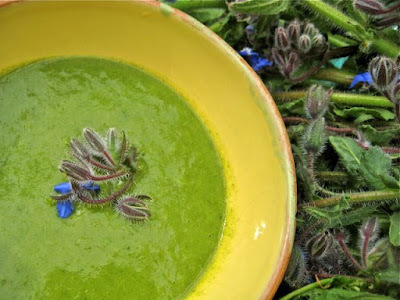 Adjust seasoning and serve with borage flowers. Just delicious served cold on hot days. Another tip is to freeze borage flowers in ice cubes. Then when served in drinks you have the beautiful and sweet borage flower any time you want. The best time to sow though in many districts is Spring because it’s best planted at soil temperatures between 10°C and 25°C. The seeds germinate easily and once in your garden, will happily self sow. But it's nor really weedy because the seedlings that emerge are quite soft and easy to pull out. Borage seeds are also loved by chickens. 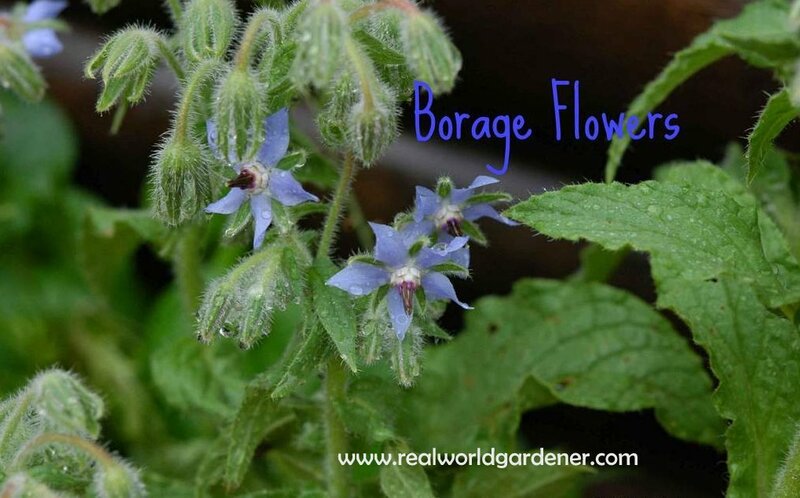 If you’ve never grown Borage before, now’s the time to start. Not suitable for indoors but possibly OK in large pots as it’s a tall plant. FAMILY: Zingiberaceae along with Turmeric and cardamom. 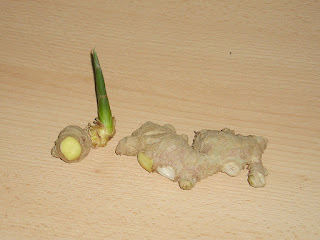 Have you ever wondered about growing edible ginger? For years I’ve wondered about growing the real deal ginger. Of all the times I’ve bought the nobbly brown root, it’s never sprouted until now. Probably because now I’ve bought organic ginger that’s not sprayed with stuff to prevent it from sprouting-some sort of growth retardant usually. Now I’ve got two bits sprouting! Before those of you in cooler climates get put off, I daresay, my own climate zone is a bit out of its range, but I’m growing it in a pot and so can you. Indoors if we have to. 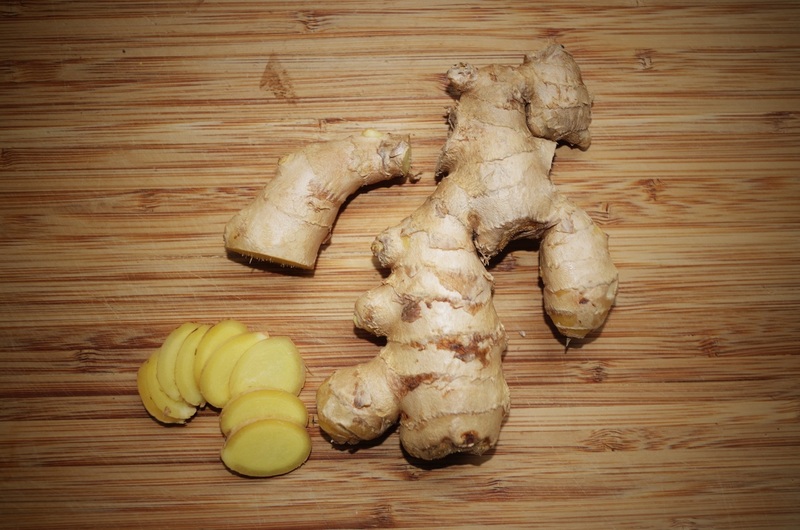 Ginger root is actually a rhizome. Ginger is native to south China, but it was the Arabs who spread it around the globe by carrying rhizomes on their voyages to East Africa to plant at coastal settlements and on Zanzibar. So what is Ginger? What does it look like already? It’s a herbaceous perennial which grows annual stems about a meter or 1 ½ m tall with narrow green leaves and insignificant greeny-yellow flowers. 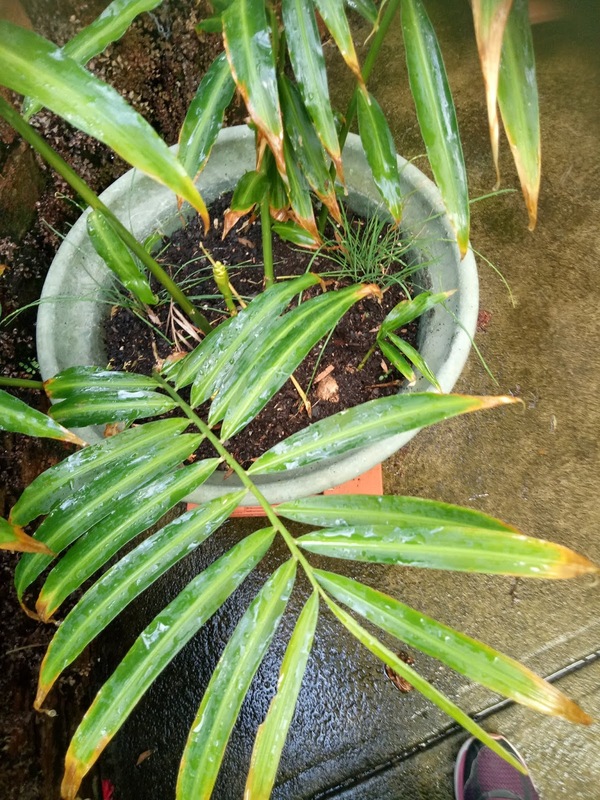 The leaves are much narrower than Canna leaves, and look more like the leaves of bamboo. They’re also a very dark green. Zingibar officianale or ginger is a tropical plant as you’d expect so it doesn’t like frost, waterlogged soil direct sun and high winds. But if you’ve got a sheltered area, maybe on your back veranda, and rich moist soil, or some good stuff potting mix, you can get by growing ginger. If you’ve also got warmer weather and high humidity you definitely can grow ginger. From reading garden forums on the web, ginger does well in the ground in temperate climates as well. For most of us, growing ginger will mean growing it in pots. If you’ve only got one sprouting rhizome, put it into a 20cm pot, if you have 3 put them in together into a large 35cm pot. You can also add one part of good compost to two parts potting mix, and that’s going to add some nutrients as well. For those gardens with tropical or sub-tropical climates you can put that piece of sprouting ginger straight into the garden after you dug in a spadeful of compost. That should be good enough. Put in your piece of ginger about 5cm below the soil surface. Remember, filtered sunlight not direct sun for the position. For cooler climates, your ginger plant can take full sun because it won’t be as intense for the most part as in the tropics. Near a north facing wall is ideal so the plant can get reflected heat. If it gets too hot in summer, move the pot into semi-shade if you can. Also, for cooler districts, move it inside at the first signs of cold weather and don’t water it too much. The best planting time is late winter/early spring, but if you’ve got a piece sprouting now, don’t waste an opportunity to garden, put it in anyway. Ginger grows quite slowly and doesn’t mind being a little bit root bound if it’s in a pot. A good thing about Ginger is that it won’t overtake your garden, because, it’s slow growing and after all, you’re going to be digging it up every year to harvest the rhizomes for your cooking. Drying out will most likely set the plant back quite a bit, and even cark it so in hot weather keep up the water supply. To supply humidity for arid climates, you’ll have to get out there with the spray bottle and spray it when you think of it, hopefully every day. For those growing ginger in the ground, add plenty of mulch to keep the ground moist. 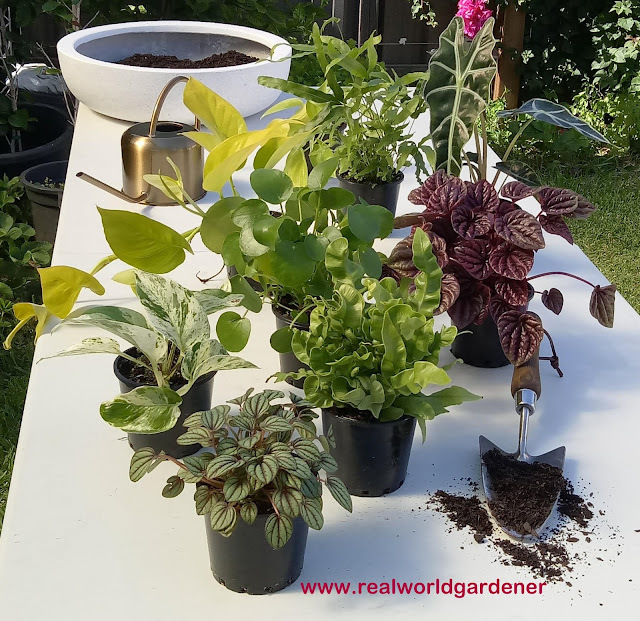 Ginger growing in pots will need fortnight feeds of liquid fertiliser if you haven’t added any controlled release or organic slow release fertilisers to the mix before planting. Now the most important question, when can you dig it up? All books will say the best time to dig up your ginger plant is when all the long green leaves have died down, 8 – 10 months after you’ve planted it. This is easy if you’ve been growing it in a pot, because you can tip the whole thing over and just pull it out. 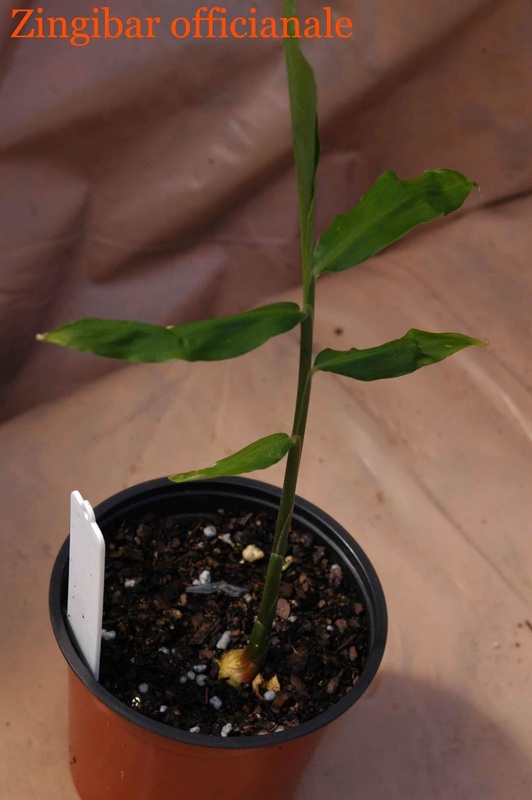 For areas where ginger growing is out of its range, you might be best to leave it for a couple of years for the rhizome to build up in size before tipping it out. Break up the rhizomes into smaller useable pieces and either store it in the freezer, or my tip is, put the pieces into some Chinese cooking wine or sherry in a resealable jar and place it in the fridge. Doing it this way keeps it fresh for quite a few months. Don’t forget to replant some rhizomes for your next years’ crop of ginger if you’ve been successful that is. Why is Ginger Good for You? Ginger is said to stimulate gastric juices, and provide warming and soothing effects for colds and coughs. Ginger is an excellent natural remedy for nausea, motion sickness, morning sickness and general stomach upset due to its carminative effect that helps break up and expel intestinal gas. Ginger tea has been recommended to alleviate nausea in chemotherapy patients mainly because its natural properties don’t interact in a negative way with other medications. Ginger is a very good source of nutrients and essential vitamins. It is also a good source of minerals, such as potassium, magnesium and copper. Ginger also has Calcium Carbohydrate Dietary Fibre Iron Magnesium and Manganese, but wait there’s more. Many thanks to the tropical permaculture group for providing some of the growing information. 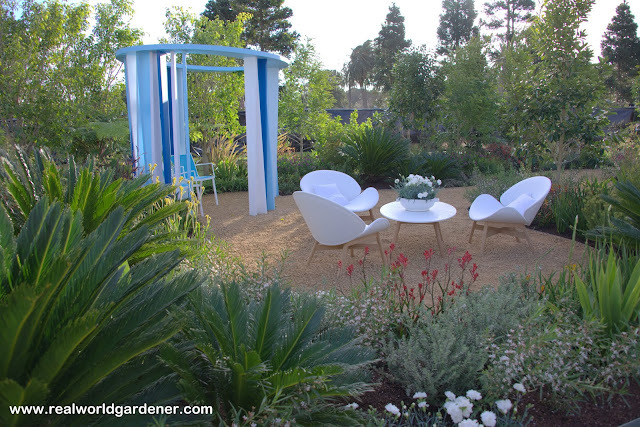 Modern garden style is not a new phenomena and is in fact nearly a hundred years old. The word ‘modern’ gives us the wrong idea because modern is used to describe something that’s recent. Perhaps the landscapers association or group should consider changing the style that it represents. Perhaps you’ve inherited a modern garden with wide concrete paths and river pebbles in the garden beds. Most likely though the modern house of post world war II is becoming a thing of the past. Still the principles of the modern garden are useful, sticking to primary colours and architectural plants. In the photo Cycads provide the architectural plants and kangaroo paws add the primary colours. Common geraniums belong to the genus Pelargonium(280 spp), while true geraniums belong to the genus Geranium. (422 species). The name geranium comes from a Greek work geranos, which basically means crane. True Geraniums are called Cranesbills because of the shape of the fruit capsule? While both genera were originally classified as geraniums, in 1789 the two genus were separated. Confused? The common name geranium is used to describe Pelargoniums and Geraniums. Geranium flowers have five very similar petals, and are thus radially symmetrical (actinomorphic), whereas Pelargonium flowers have two upper petals which are different from the three lower petals, so the flowers have a single plane of symmetry. When we think of Geraniums, window boxes, and potted gardens comes first to mind. 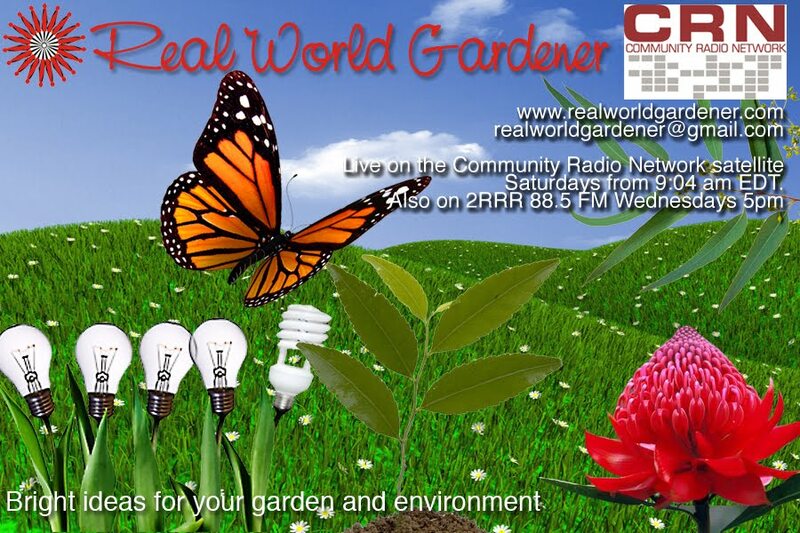 Recording live during the broadcast of Real World Gardener radio show on 2RRR 88.5 fm Wednesdays at 5pm.